For their newly acquired Wild Turkey brand, Campari selected FLY to increase sales by refreshing the brand to expand its appeal beyond its established Southern, male, blue-collar core and target a category cluster comprised of 25-39-year-old men in urban centers. FLY examined the psychographic overlap of these two groups and identified an overarching brand platform—badass—that was unique, believable, and true to the brand’s core essence. More to the point, it was a position that appealed equally to men in Alabama, New York City, and Sydney. This led to the development of the tagline (and rallying cry) “Give ’em the Bird,” and a worldwide campaign was born. 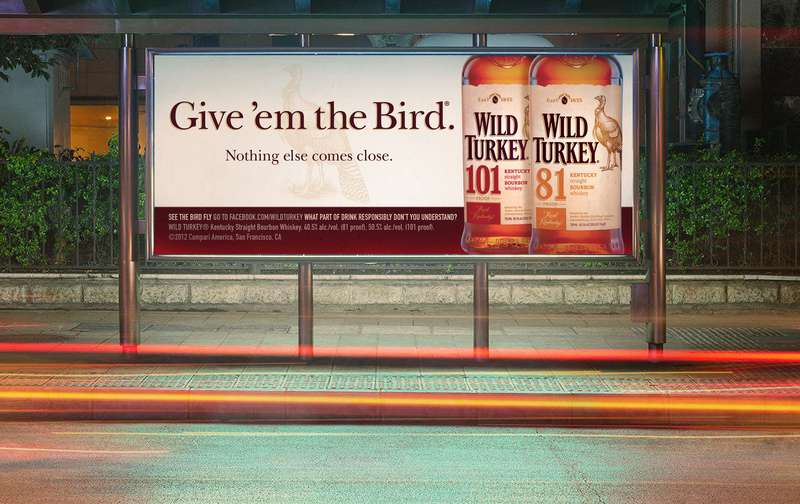 Wild Turkey’s sales turned around in a big way, showing a double-digit increase. We had an inkling the campaign would reach the national conversation when thousands of Wild Turkey drinkers began to repeat the line “Give ‘em the Bird” back to us on the Wild Turkey Facebook page. Within six months, the game show “Who Wants to be a Millionaire” posed the question “What spirit features the tagline “Give ‘em the Bird?” The brand is clearly breaking through.